I am pleased to announce the addition of another 18″ x 24″ poster to my Etsy Shop. The poster is new, but the original NOAH’S ARK piece was made 28 years ago! 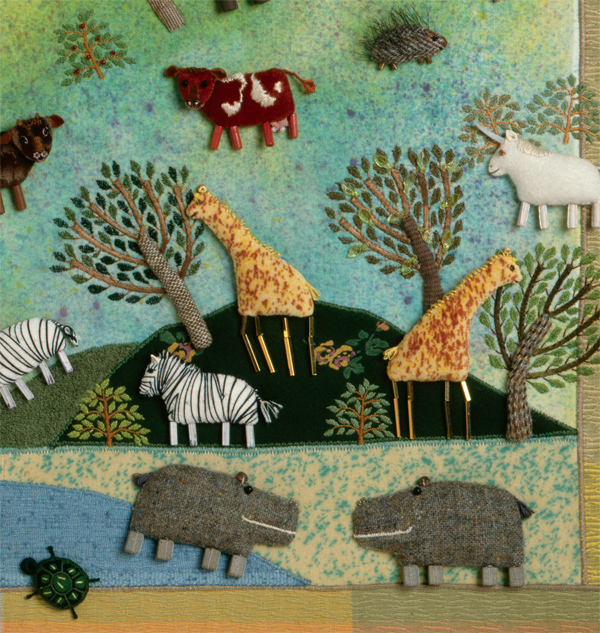 I remember working on it during a transitional period, when I created animals that were similar in size and style to my pins (see them here), which I sewed to dyed and appliqued cotton velveteen background fabric. The animal’s legs are formed with tube beads. I also remember finding the orange upholstery fabric that’s around the border while shopping at a large fabric store in Berkeley, CA. 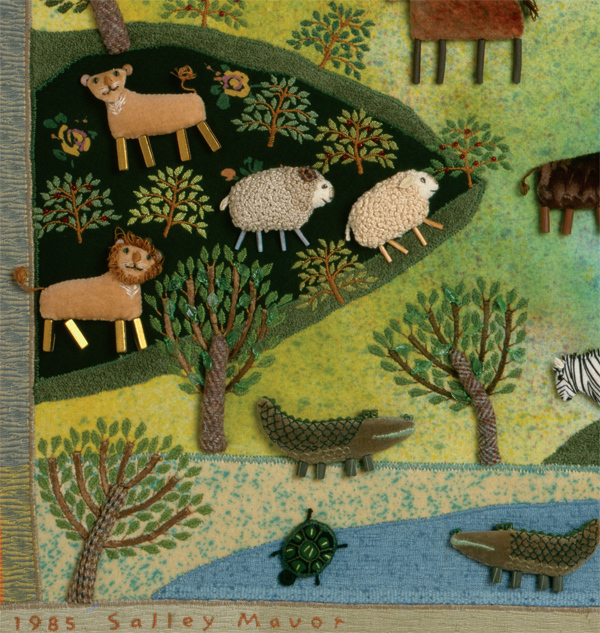 I can recall playing around and re-positioning the animals for a long time until they looked right. It was also during a time when I fell in love with hand embroidering little leaves on bushes and trees. 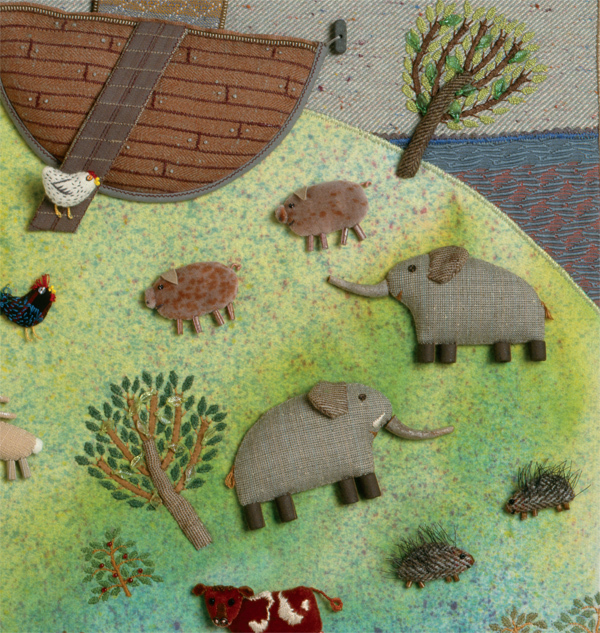 You can see some details of the animals and landscape below. 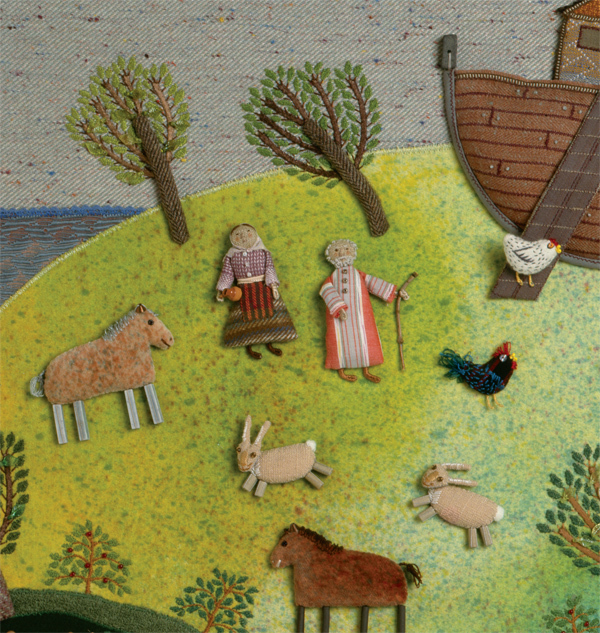 The NOAH’S ARK Poster is available from my Etsy Shop here. 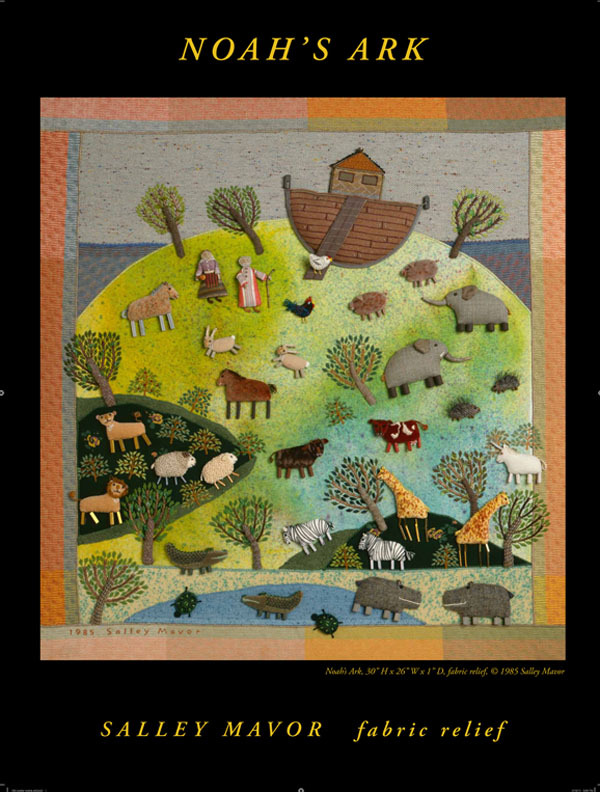 This entry was posted in Animals, Embroidery, Etsy Shop, Fabric Relief, poster by Salley Mavor. Bookmark the permalink. Another WONDERFUL work of art! You’re simply the best, Salley! This is pretty amazing! God, I love how your mind works!!!!!! I just went back and read Pins part 1. I adore the pins you made, and the pic of you in your studio during school. My dear mother-in-law graduated from RISD and was the Art Supervisor for the Seekonk schools for 30 years until retirement. I learned a lot from her and she always encouraged me and we had a lot of fun together for many years. Besides missing my own mom, I really miss my MIL. I will go back and read your posts – I especially love to read how you started and show the things you made so long ago. I wish I had pix of things I made from so many years ago, but, alas, I never took any. I made things and gave most everything away!!! You are truly amazing and I love your work, then and now. Thank you Sandie! I’m glad that you had such a positive experience with your artsy MIL.